Mike Vanausdoll | Kitchen Seed Company Inc. In 1976, Mike graduated from Lewis and Clark Junior College with an Associates Degree, and after a few years of various jobs in the Jerseyville, Illinois area where he grew up, he began his seed career with Pioneer Hybrid International which eventually led him to Kitchen Seed Co., Inc. 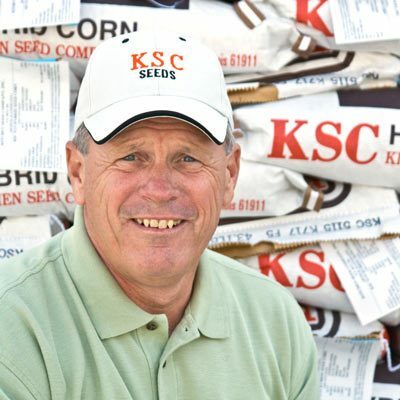 He started at Kitchen Seed Co. in 1981 and moved his family to Arthur, Illinois to later become Co-President of the company. He and his wife, Kim, now live near Lake Shelbyville in Shelby County. Mike's primary responsibilities at Kitchen Seed include marketing, research and product development. He was acting sales manager for 20 years and is a past President of Illinois Seed Trade Association. He currently serves on the Board of Directors for Illinois Crop Improvement.